Framing is one of my favorite behavioral economics podcast topics. In the past few weeks, I have covered foundational topics like loss aversion, anchoring & adjustment, relativity, scarcity, and availability. 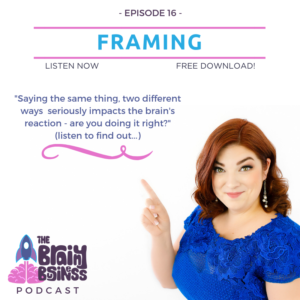 Today, I talk about one of my favorite concepts which is framing. Before digging in, I’d like to give a shout out to Lara Currie who left a stellar Apple podcast review and invited me to be on her podcast Difficult Happens. Our subconscious brain evaluates everything very quickly and uses assumptions to make decisions. If you think of this in the context of framing, this is the reason an inexpensive print will look expensive in a nice frame and cheap when taped to the wall. Framing also works hand-in-hand with the concept of loss of version. If you frame something as a loss someone is more likely to take action on it than if it were framed as a gain. In this episode, I dive into how our brains interpret framing and how these concepts can be applied to your business. [12:21] An easy way to think about framing is thinking about how a beautiful frame impacts a picture compared to no frame at all, or a cheap looking frame. [13:53] Think about a poster on your wall stuck up with tape as compared to a nice print in a beautiful frame. [14:44] Why does the frame matter? It’s because our brain processes everything very quickly and uses assumptions to make decisions. A well-placed aesthetic means it must be a high quality piece. [16:24] Children’s artwork put in a frame looks like amazing beautiful art. [16:52] To our brains, what we say is not as important as how we say it. [17:18] Our brains process nonverbal communication. All of this other stuff makes a huge difference. [17:40] The nail salon example from episode two was an example of being too literal. They had an outdated sign that sent a negative message to our subconscious brains. They were able to turn this negative into a positive just by changing the wording. [21:34] Framing is at the heart of the concept of loss aversion, which was the focus of episode 9. [21:48] Framing something as a loss is more likely to get someone to take an action than framing it as a gain. [21:59] The motivation of a loss is twice as powerful as the motivation of a gain. This is also called Prospect Theory. [22:58] Examples of framing coming into play. A food labeled as 90% fat free is more attractive than one labeled as 10% fat. [23:22] This is actually saying the same thing, but the way it is framed or what we hear makes one option sound better than the other. [24:52] The frame of our story and our experiences shapes the world that we live in. Framing is about what we say and who we say it to. [27:36] Tversky did a test on his colleagues at Harvard medical school, having them read statistics about two treatment options for lung cancer – surgery or radiation. [28:35] People choose options that are framed in a positive light. [31:42] The principal in this story is called OPTIMISM BIAS, and it will be a topic of a future podcast. [32:22] The three different categories of framing: Risky choice, attribute framing, and goal framing. [34:18] . Have you ever heard commercials for Chevron with Techron? We assume that Techron is something valuable, but it’s actually a name that Chevron made up. [35:33] Think back to episode 11 on Anchoring and Adjustment, when I asked you if there are more or less than 10,000 emperor penguins in Antarctica. The same way your subconscious assumes I must know something about populations, your brain assumes brands must know something more about gas. [36:56] Ford calls itself “America’s best-selling brand”. That’s actually an empty claim that sounds good. Yet, it means something to your brain. [38:06] An example about “AVG DAY CARE”. Is this a good name? [41:21] Next week I’m going to dig into the science of choosing the right numbers and how to use statistics in your messaging. [41:48] If your toothpaste is recommended by 4 out of 5 dentists, does that mean 1 in 5 dentists don’t recommend that toothpaste? [42:56] Some of the most misleading terms in real estate and what they mean. Cozy mean small. Charming means old. Convenient location means loud. Etc. [44:25] This is also getting into the concept of PRIMING – which is going to be the topic of episode 18. [44:41] The way you explain something sets an expectation and can impact the way someone feels about the whole experience. [46:05] All the adjectives included into a description could be considered the frame. [49:08] When I worked at the credit union our biggest competitor claimed they were “a member owned, not for profit credit union” even though, that is basically the definition of a credit union. [55:26] Next week, episode 17, is taking framing a step further, into the best ways to display numbers, when you should use each one, and more. You rock, Melina! Thank you for the shout out!!! It was my absolute pleasure to work with you. I’m blown away by you and Brain. Thank YOU! Ditto, and you are welcome. I appreciate you more than I can say.